We love, love, love, love stinging nettle as a food. We harvest this wild green regularly and use it primarily in our very dense greens soup. Five years ago I would not have imagined that I would be harvesting nettle regularly. Even the slightest brush up against it would leave me with an aching rash for two days. I picked it occasionally for tea but limited my harvests to about once every few months and to about five sprigs. Now we harvest it regularly. The key difference? I am ready with a rash remedy that works for me. In my case, the remedy is “lamb’s quarters,” a plant that grows right with the nettle at lower elevations here in the spring. I make an alcohol extract from it each spring to keep it on hand throughout the year. Your first task is to find a remedy that works for you and keep it in stock. Typically when I harvest, I harvest mature nettle plants with large leaves. I pick long stems with scissors and then use the scissors to cut off the leaves. Large leaves will fill up a bag or bucket fairly quickly. The stems make good tea. 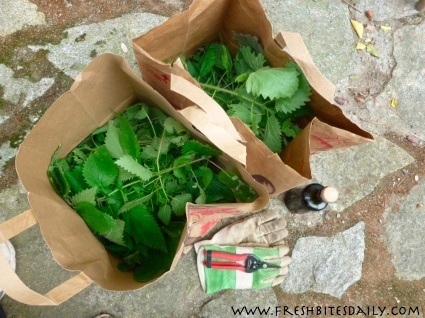 However, you can reduce your risk of a rash with one simple trick: Limit your harvest to young, tender nettle plants. The plants do not sting when they are young. You can even harvest them without gloves and just pop the tender tops right into your soup pot. I discuss some of these issues in the video below. 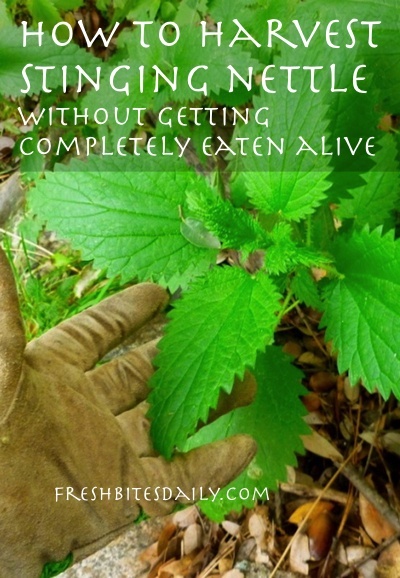 That’s it, that’s the big piece of advice: Harvest young nettle if you are concerned about being eaten alive. This key bit of advice (“harvest young nettle”) came in handy one memorable spring day back in 2013. 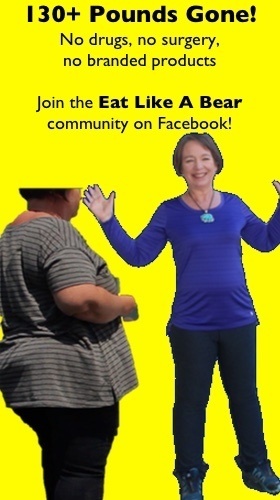 My son was attending his charter school, a school for home schooled children that offers enrichment and social activities to complement the core curriculum that is taught in the home. This is an unusual group of kids and families. I was ready for anything actually but really expected to find them doing something on the order of “smoking.” That’s what middle school kids do behind buildings, right? What were these kids doing? They were daring each other to touch stinging nettle. Two children already had hands inflamed with nettle blisters. Ha! I was right in my element. I told them all about the nettle remedy that grows right next to nettle in the spring at that elevation — “lamb’s quarters.” We looked around and found a plant, right on cue. The children with blisters rubbed a lamb’s quarters leaf on their rashes and it brought nearly immediate relief, right on cue.